Hi loves! How have you been? Enjoying your weekend? I hope you are :-). Today I have a quick post for you showing another gorgeous Contrary Polish shade. This one is called The Boulevard and it comes from the same collection as River Market. All 6 shades are inspired by places form Kansas City, which is were Carrie lives and that's why the collection is called No Place Like Home! I ordered this beauty from Hypnotic Polish and I must say, she packs everything so cute! I posted an image of it on Instagram so you can take a peek there. This shade had been on my wishlist for a while now, as everything with a copper like shimmer intrigues me, and it didn't disappoint! Contrary Polish The Boulevard is a muted navy jelly filled with a coppery, orange, pinkish shimmer. In regular lighting it will look almost black (at least it did to me) but I don't care, that fiery shimmer lights up beautifully! I used 3 thin coats and topcoat and was very pleased with the result :-). What do you think of this shade? Do you like shimmers like these as much as I do? Tell me in the comments! Contrary Polish is a hand-blended indie brand made in Kansas City, USA. Carrie specializes in contrasting shimmer polishes which are 5-free and cruelty free. You can buy Contrary Polish at various e-tailers, please check the full list here. You can connect with Contrary Polish on Twitter and Facebook. This shimmery black polish is gorgeous! You picked really lovely shades! If I ever find them in Slovenia I'll buy Sandhopper and PlumBeach! This one definitely calls my name, more than the previous ones you showed! :D it's a real stunner! You should :D great packaging and lovely polishes! I hope they make it there! Would be great! I am still debating on OPI Scores a Goal, actually! And thanks for the sweet words :-). Unfortunately I didn't find this LE ç_ç I just hope that in the future they decide to relaunch these shades, maybe in their permanent line. I hope you found some Sam! They are must haves! They're all beautiful! My least favourite is Roz, actually: not a big fan on the colour. 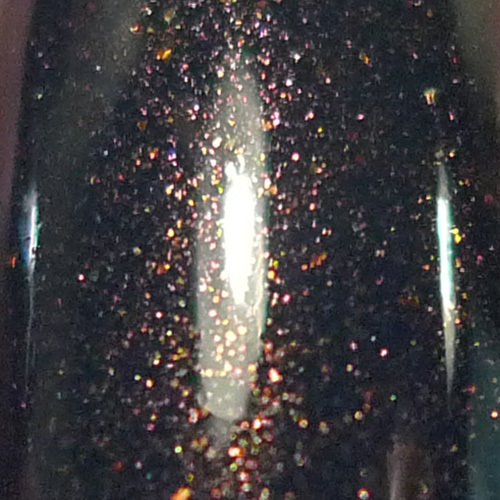 I got piCture pOlish Aurora to quench my thirst for multichromes a bit, but I'm craving for I <3 Nail Polish Cygnus Loop! !